Tree removal in NJ is an essential cleanup job. Fallen trees are damaging in so many ways. More than having a large log in the middle of your property, a fallen tree may have taken something else with it. Maybe it took your roof’s shingles, or the glass in your windows, or maybe it smashed into the power lines and cut power to the entire neighborhood. No matter the result, you need this job handled quickly and by the experts. Amazing Tree Services offers years of trusted tree services to enhance the safety and appeal of your property. Our tree removal professionals are equipped with the tools and knowledge to perform efficient and affordable tree removal in NJ. We are committed to your satisfaction and look to exceed your expectations, making your property a more beautiful, safer atmosphere for family, friends, visitors, and guests. We advise residents of New Jersey that you’ll only create more harm if you attempt a tree removal yourself. Dealing with power lines is perhaps the most critical element of the tree removal in NJ process. Severed lines are extremely dangerous for the layman to approach. Even with caution, you need the right training to attempt this cleanup process. A tree is heavy, and the damage it may have caused is massive. Don’t hurt yourself more than you’ve already been effected. Let us get in there and remove the tree safely and effectively. Then your power can be restored and you’ll no longer be the enemy of the neighborhood. And when fallen trees smash into your home, you can be at a loss for more than words. This is also a critically dangerous cleanup process. You may think you can handle it with a little power and might, but the truth is you may cause more damage than the initial blow from the tree. Stand back, let tour expert tree removal in NJ restore your peace-of-mind. We’ve spent the majority of our lives dealing with trees. Not only are we in awe from their natural beauty, we are also well aware of the destruction a fallen tree can cause. We know how to neutralize these dangers, and work quickly so that you can get back to your normal life. Contact us today to see how tree removal is your friend in the time of need. For more information about our professional tree removal in NJ, call Amazing Tree Services at (973) 343-6868. Trees are a wonderful design element of nature. But when they work against our productivity, they are more a nuisance than a gift from the planet. We can make the trees work for you. Our tree service in Morris County NJ offers the gamut in order to help you get the most from nature. Whether you’re planning on cutting down trees, trimming and pruning your current trees, lot clearing, tree removal, or something else, we have you covered. Amazing Tree Services offers years of experience as tree service professionals. We are a fully insured and expertly trained tree company with years of experience. Our expert tree service in Morris County NJ ensures that trees on your property are well-manicured, safely removed, and provide the peace and value you are looking for. Tree cutting is a basic element of our tree service in Morris County NJ. Dead or decaying trees need to be removed. Lots need to be cleared for building. Yards need to be opened up for maximum space. There are tons of reasons why you would cut a tree. With the experts, we guarantee no damage or destruction in the path of the falling tree. Just an opening you didn’t know you had. Tree pruning and trimming is essential to keeping your property looking great and properly efficient. Trees can be trimmed to remove branches, limbs, or other elements that may fall or wither away. More than this, trees will look great and grow the way nature intended. You will find the trees much more manageable after a pruning or trimming. Consider this a haircut for the natural beauties. 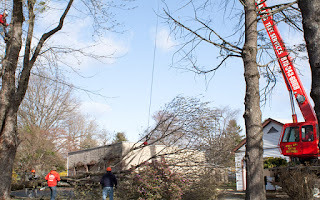 Tree removal is an essential part of our professional tree service in Morris County NJ. To get rid of fallen trees that have already laid their destruction is a job that should be handled immediately. The concerns are multiple. Perhaps your home or office building took heavy damage. Or maybe, more dramatically, the tree hit a power line. More than just black you out, it’s possible the tree cut power for the entire grid. You need to clear the tree and get everything back in its working order without waiting. We’ll be there for you in the event of disaster. But we also hope that you take one of the previously mentioned services to prevent this disaster in the first place. 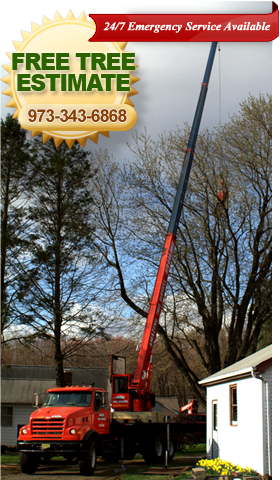 For more information on our affordable tree service in Morris County NJ, call Amazing Tree Services at (973) 343-6868. Tree cutting in NJ is a difficult job. Not that we mind, however. We enjoy the work quite a bit. Still, we highly recommend that you do not attempt the work on your own. It is a delicate skill that requires years of training and experience to do without causing any damage to your home or property. Amazing Tree Services offers years of experience to homeowners and commercial land owners looking to maximize the appearance of trees on their property with expert tree cutting in NJ. We offer high-quality tree cutting services to ensure you have maximum benefit from your property and as minimal a threat from nature as possible. When storms pass through your area, they can knock over dead or decaying trees and destroy more than your home. Sure, nobody wants a tree sticking out of their window or roof. But nobody can live in the modern age without electricity either. In the cold seasons, you’ll be left to freeze. When it’s hot outside, your home can become an oven. More than this, you can’t do anything you need for personal or business requirements. Call us to perform professional tree cutting in NJ before they destroy more than your roof. Cut them down before they prevent your daily life and cause problems between you and your neighbors. Tree cutting is more than preventing danger. Sometimes, it’s about opening a new pathway of creativity for the property. If you recently bought a plot to build your home or office on, you may need to clear the lot of any current trees, shrubs, and other types of growth. In this case, you’re building instead of destroying. We can even plant new trees around the property once you’ve finished your project. We can also perform our affordable tree cutting in NJ for cosmetic reasons. We can make your property look great and make the most of your new open space. Then, you can design around the vision you have. You can use nature to your benefit, not to your detriment. Call us now to see how our tree cutting services can work to bring out the beauty of your property and prevent potential danger. For more information about our prompt tree cutting in NJ, call Amazing Tree Services today at (973) 343-6868. Are you thinking that it’s time to get rid of a tree impeding on your property? 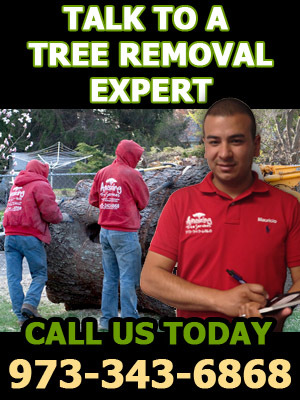 With our expert tree removal in NJ, we can help you with that. Amazing Tree Services is dedicated to providing New Jersey home and business owners with a safe environment for loved ones and all on the property. We utilize our years of experience and prompt service to remove hazardous trees from your property without delay. There is a variety of reasons why you might want to remove a tree. No matter the reason, we’ll do just that. Some trees can become unsightly and unattractive. Getting them removed might be just what your property needs. We’ll do it in a way that maintains and keeps the landscape healthy. Another reason you might call for professional tree removal in NJ around the property is because of wildlife. If you’re having problems dealing with birds, squirrels, raccoon or bugs because of trees we can help with that. It’s true that many critters might take up shelter in trees. These critters can migrate into your property causing all sorts of problems. We’ll remove the trees in a way that doesn’t harm the wildlife and gives you peace-of-mind for the future. Sometimes tress can be really unsightly. They grow and expand and impede onto properties. In some scenarios, improper tree removal in NJ can really damage a property. We’ll make sure that doesn’t happen. From stump grinding to the highest branch we’ll properly take care of the tree. Thereafter you won’t have to worry about any damage a tree may cause on a property if left to expand any further. Timing can be crucial when removing a tree. If you think that a tree is causing any damage don’t neglect to contact us. We’ll do our best to take care of your situation. After, your landscape will look updated and fresh. When trees grow to be unsightly it can make a property unsafe and looked that way as well. Proper tree care and removal is essential to maintaining a property properly. Our professionals will work efficiently and safely to make sure your needs are met so that your property stays safe and beautiful for many years to come. It’s true trees benefit our environment greatly, but some do get to a point where they can cause serious trouble. We understand how to deal with unwanted or troublesome trees, and our emergency tree removal in NJ is available with 24/7 service to remove them in ways that keep you and your property safe. Amazing Tree Services is committed to alleviating stress related to a hazardous tree on your property. Call us today at (973) 343-6868 to schedule a tree assessment and begin expert tree removal in NJ to protect your home or office from fallen branches or trees. Are you looking for tree services in NJ? At Amazing Tree Services, we pride ourselves in our commitment to customer satisfaction and prompt tree services that leave your property safe and aesthetically appealing to guests and anybody passing. Our professionals timely perform our services to give offer minimal interference with your daily routines. Before long, the trees on your property will be updated with high quality results from our years of experience, professionalism, and attention to detail. Trees are an important natural resource. They provide us with oxygen, and can be absolutely stunning to look at. Proper tree care and maintenance is ideal for securing the health and beauty of a tree. We’ve made it our duty to offer professional tree services in NJ that will help you with your tree needs. After years of harsh weather conditions, many trees can become broken and battered. As with your pets, a tree needs to be trimmed and groomed to maintain aesthetically pleasing and healthy. We’ll do our best to make sure your trees stay beautiful for years and years to come. Whether they need a trim, newly planted or cut, we’ll be able to assist you with your needs. As you know, there are a vast variety of trees on our earth. Understanding how to properly care for certain trees is crucial for the health of the tree and the landscape. We know trees and will be able to accommodate whatever your specific tree situation might require. Certain trees are likely to house wildlife. Some can house specific types of good fungus and bacteria (and also bad fungus and bacteria.) It’s best to call for our expert tree services in NJ to manage individual trees in a way that’s healthy and safe for the surrounding environment. Safety is a priority when dealing with trees. We make sure to deal with them in a way that is safe to the property and any individuals or wildlife in the surrounding area. It’s of the utmost importance to us to deal with trees in a way that is ultimately beneficial to you, and the environment. When deciding on who you would like to work with the trees around your property take into consideration our concern and dedication. We’ll work in whichever way is known to work best. It’s in the best interest of us, our clients, and the environment to do so. Please contact us to learn all the ways we can help you with any tree situation you might have. 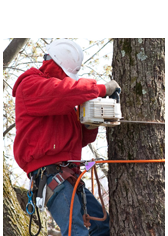 Our professionals are available for 24/7 emergency tree services in NJ when branches or trees have become dangerous and require immediate attention. To speak with a professional about the expert tree services in NJ we provide, contact Amazing Tree Services today at (973) 343-6868. There are a great number of reasons you might need tree cutting in NJ. Here we’re going to list a few reasons why it might be time to get a tree removed from your property. 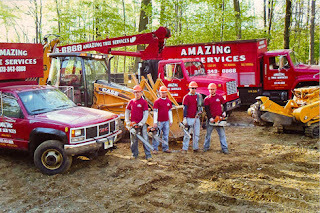 The professionals at Amazing Tree Services provide expert tree services to residents and business owners in New Jersey. We are dedicated to protecting your property or giving trees an updated appearance using industry methods and up-to-date equipment, providing prompt tree cutting on your property. There’s a variety of benefits that can come with professional tree cutting in NJ. We’ll explain why a tree needs might need to be cut, and why it could benefit you and the environment in the long term. It’s possible that a tree has grown too old, abnormally, and could be a hazard to people that cross paths with it. Perhaps branches are falling, and strange diseases and fungi are growing upon it. This could house all sorts of dangerous bacteria that can be harmful to the trees, wildlife and people around it. Calling us to perform emergency tree cutting in NJ to remove a tree with dead or dying branches, snapped branches, or diseased trees is the best decision for the health of the surrounding environment. Some trees can grow, and become unsightly. If you’re looking to revamp your landscape then it could be time to cut down whatever trees are getting in your way. We’ll remove them in a way that’s safe and sound for the property. This way you can make decisions on what you would like to do next to make your landscape pleasing to the eye. Trees can grow high and wide, blocking your view from the inside out (or vice-versa). Making the decision for NJ tree cutting can totally change the way your home or building looks from the outside and increase your visibility from the inside. It will give your landscape a much open, newer look. Where having tress surround a building might make it look older and less maintained. One of the greatest benefits of cutting old trees is the ability to plant brand new ones! As we said before, some trees are just too old and broken to really maintain efficiently. Cutting those and replacing them with new ones that you can take care of would be a fantastic idea. Trees are a beautiful addition to any landscape. Out with the old and in with the new. We’ll help you with your tree transition so you don’t have to worry about disposing and cutting down the old, worn trees. Leave it to us. To talk to an expert about tree cutting in NJ, call Amazing Tree Services today at (973) 343-6868. A tree removal in NJ service is more than the name implies. Sure, we do clean up your yard and get trees off the ground and off your property. But we also make your life much easier after storms or in tight property areas. We can even bring the most out of a commercial location by fostering the desired mode of urban development. Yes, the right tree removal company knows how to bring the most out of any land surface area. At Amazing Tree Services, we combine our years of expert service with leading methods to perform safe tree removal in NJ. Our professionals ensure that a tree is in need of removal before taking action, aware that this is a service meant only when other services will not suffice. If a tree is dead or dying, diseased, or has become a hazard on properties, tree removal may be the solution you need. During an emergency situation, you may be at a loss as to how to call. If a severe storm has devastated your property, leaving trees, shrubs, and other natural debris in your way, we can clean it up in no time. We’ve seen some true disasters in our day. This makes us sure we can handle your property, as our experience has taught us much about the process and how to help you through the mess. If fallen trees have broken or cut power lines, we know how to solve the situation quickly and safely with emergency tree removal in NJ. It may be less time sensitive than such an emergency. It may be as simple as having a tight yard or property and wanting to get the most of your space. That’s not a problem either. This situation is an easy fix and we’ll open your yard up to new possibilities. We can even plant younger trees or smaller species of trees to fill the missing gaps, if you so desire. Maybe a tree rests between your property and your neighbors, and you want to solve a property dispute with professional tree removal in NJ. Let us be the middle man in that dilemma. Your home is great, but what about the office? Urban development is critical to an ongoing corporate desire for success. To clean up your commercial location, our expert tree removal in NJ service will take the time and care to assess the land and open it up the way you want. Contact us today if you would like to see your land in a new light. For more information about tree removal in NJ and how we can help make your property safer, call Amazing Tree Services today at (973) 343-6868. Are you looking for tree services in NJ? At Amazing Tree Services, our fully insured and certified tree professionals perform various tree services from tree trimming to tree removal. When you call us for a free tree estimate, we will assess the condition of the tree or trees on your property and develop a strategy to keep the aesthetic beauty and safety in tact. Our services are performed promptly and efficiently, allowing you to maintain your daily routines with peace of mind. The trees on your residential or commercial property are a great gift from nature. Not only do they look great, they provide oxygen to the world and give you shade and sometimes fruit and flowers. But professional tree services in NJ are needed sometimes, in order to get the most from this natural gift. This is where our company can serve you. Tree pruning will assist your property by removing parts of the tree that may be dying, decaying, or hazardous. By pruning, you’ll find trees that will grow taller and healthier, because our experts now how to increase the sturdiness of the base and remove any internal diseases before they spread. Falling branches and limbs can cut power if they fall on a power line, and they can also damage the home below. Eliminate these threats, and also increase the flower and fruit production with pruning. We can also cut down trees and clean up your property overall. Dead trees pose a threat, as the individual parts can wreak havoc when they fall down. We will get the dead trees off the property and plant new ones in their place if you want. Or if you want the open space, enjoy a bigger yard or garden. 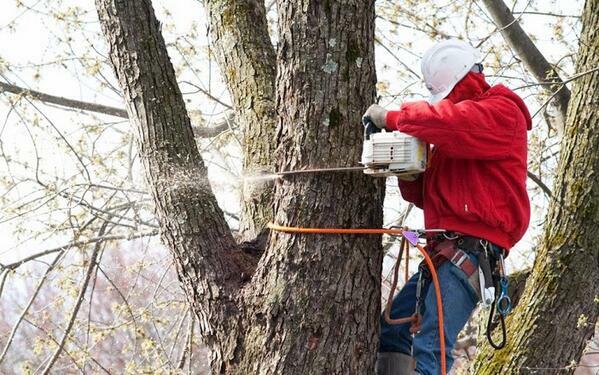 When we perform tree services in NJ, including removal, we aim to make sure no other options are available before we remove the hazard from your property. If you want to completely remove the trees in one area in order to build a commercial or residential property, we can also help you. Our lot removal experts will give you a fresh canvas upon which you can create the building of your dreams. If you have an existing property and want space for a parking lot or expansion, don’t worry. We’ll open up the land and let you do with it as you wish. Our expert tree services in NJ are a great benefit to your home or office property. You can enjoy the benefits of nature, but using human ingenuity, you’ll have it ordered as you please. Call us today for your tree trimming, pruning, removal, and lot clearing needs. Space is a great thing to waste. For more information about our professional tree services in NJ, call Amazing Tree Services today at (973) 343-6868. Although people were tasked to live aside nature, they have also been given the knowledge and talent to shape the world around them to ensure a better lifestyle. Keeping trees in our cities, streets, and personal properties is one such example of this notion. While trees are a beautiful sight to behold, their heavy branches oftentimes get in the way of our comfort. Professional tree trimming in Morris County NJ is a discipline aimed at nullifying the harmful effects of falling branches. 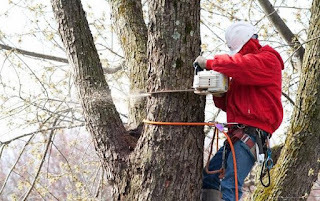 At Amazing Tree Services, we use our years of experience and knowledge of the deciduous trees in our area to ensure proper and safe tree trimming in Morris County NJ. Our goal is to keep your trees healthy while maintaining the aesthetic and safety of your property, and we are devoted to achieving this with your satisfaction in mind. Nobody likes a power outage or blackout. When the lights go out, and everybody’s still home, it can feel like life was put on pause. You find yourself scurrying about, handling many things you never thought you’d have to do. You try to save the food in the fridge and find candles, flashlights, and blankets. What causes all of this devastation? Falling tree branches. Not always, but most of the time, tree branches fall on our power lines and cut service to thousands of homes. Heavy storms push strong winds that cause branches and tree limbs to fall from the base of the tree. Precipitation, such as rainfall, snow, and ice, doesn’t help the matter. Our expert tree trimming in Morris County NJ can prevent these setbacks from occurring, keeping the lights on and your home safe. We understand trees and where their weaknesses lie. By inspecting each tree carefully, we look for problematic branches and limbs and trim them off. This process is safe to the tree, to our workers, and to all residents, so don’t worry. We have years of experience under our belts, and we bring quality and care to every trimming job we’re commissioned to. In the event of an outage, we are often called to repair the damage and get the grids working again. We’d like to prevent these calls as much as possible, however, and we’re sure you feel the same. Nobody wants to lose their power, however we are available with emergency tree trimming in Morris County NJ to remove breaking or dangerous limbs from both the tree and your property. For more information about our affordable tree trimming in Morris County NJ, call the professionals at Amazing Tree Services today at (973) 343-6868. Small trees can be easily cut down by the handy homeowner. However, the tree cutting in North NJ of large trees should always be done by the professionals. At Amazing Tree Services, we have the expertise to safely and efficiently cut large trees and remove them from your property. With years of experience and dedicated service, we provide high quality tree cutting in North NJ done promptly. There are many aspects of cutting down a tree than one may not consider. This may result in a tree splitting the roof and falling into the living room. But tree cutting is not something homeowners should dread. It’s a normal aspect of owning a property. Having our professionals perform NJ tree cutting for you saves time and energy, while performing with safety in mind. One may cut down the trees on their home for many reasons. The tree may be damaged, rest between two properties, or maybe a homeowner wants to put something else where the tree is rooted. Either way, there are important things to note before going ahead with the process of tree cutting in North NJ. A careful homeowner should inspect the tree from all angles before determining if it should be cut. They should check if the tree is standing tall or if it is leaning over. If the tree is leaning heavily to one side or another, it is wise to cut it down before its trajectory causes spacing problems. If the tree has dead or broken branches, then this is an indication that the tree is on its final legs. One should also inspect the area surrounding the tree. This is important to determine if there is a clear falling lane where the tree can fall to safety. While all trees may fall, what it lands on is highly important to the process. Nobody wants a tree in their living room. Lastly, one should look at the trees in the overall area. Do any trees get in the way of where this tree may fall? Do any branches intersect with a neighboring tree? All of this should be determined before deciding on tree cutting in North NJ. We work hard to ensure the trees on your property are in good health and, if need be, removed safely from your property with tree cutting in North NJ. For more information about NJ tree cutting, call Amazing Tree Services today at (973) 343-6868. Trees provide comfort and shade. They distribute oxygen which helps us breath. They are an essential part of any ecosystem. 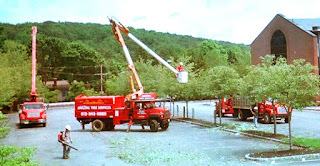 Still, there are many reasons why one would seek out tree removal in Morris County NJ. At Amazing Tree Services, we have the years of experience, the equipment, and the professionalism to properly and safely remove a tree from your property. Below are three things a homeowner should look for before they decide to get rid of a tree on their property. This could be a no-brainer to some, but if the tree is rotting or decaying, it’s time to go. Even trees that are barely hanging on may be require tree removal in Morris County NJ if more than half of its surface is damaged. These half-living trees can survive for many years if left alone, but they will grow in an unpleasant or disjointed manner. Some trees that have a mild problem may appear to be damaged beyond repair. That is why a clever homeowner should bring in our professionals before attempting to quarantine their tree population. How Solid is the Trunk? This is related to the above sentiment, however that referred to the top portion of the tree, i.e. the branches and leaves. The trunk is the foundation of the tree, so if it's damaged in any way, you need tree removal in Morris County NJ. Things to look for include cracks, seams, dead branches, and large exterior wounds that indicate interior damage. If the trunk is hollow, the tree may survive in this state for many years. Still, it is in interest to your safety to call us for tree removal in Morris County NJ. Not all trees are made the same. Some trees are useful and beneficial to the property while other trees may in fact cause more headache than benefit. Certain tree species’ to be on the watch for include: black locust, Siberian elm, Bradford pear, silver maple, willows, mulberry, mimosa, empress trees, and more. These trees produce much debris and have weaker wood that can break easily. Also, because of their shallow roots, these trees may damage the overall property, including the pavement. Before they cause destruction, call for tree removal in Morris County NJ. For more information about tree removal in Morris County NJ, call Amazing Tree Services today at (973) 343-6868. Homeowners may require tree services for a variety of reasons. They may want to plant new trees along their property for added design, shade, and a more useful yard. They may want to remove a tree from their yard that is wreaking havoc with excess debris and shallow roots. They may want the trees trimmed down or have branches removed. Amazing Tree Services combines years of experience, a professional crew, and the equipment (including our own crane) to perform the NJ tree services you need. There are many reasons to decide on our tree services in NJ, and some of them are listed in more detail below. Planting new trees is a great way to boost the curb appeal of your home. The right trees will not only make your home more gorgeous, but also provide all sorts of benefits. Tree houses can be built for young children to give them a hideaway and club house. Maybe a homeowner wants to lure a specific type of bird to their property, and they decide on a specific tree as part of the plan. Either way, trees provide oxygen and give one a place for comfort and shade. While trees are a wonderful facet of nature, some homeowners want to get rid of the tree on their property. If the tree is damaged beyond repair, it is best to cut it down early. This includes damaged leaves, branches, trunk, or roots. Our professional tree services in NJ can promptly and professionally perform NJ tree removal to create a safer environment for your family and home. If any of these aspects are worn down, the tree is doing more harm than good. 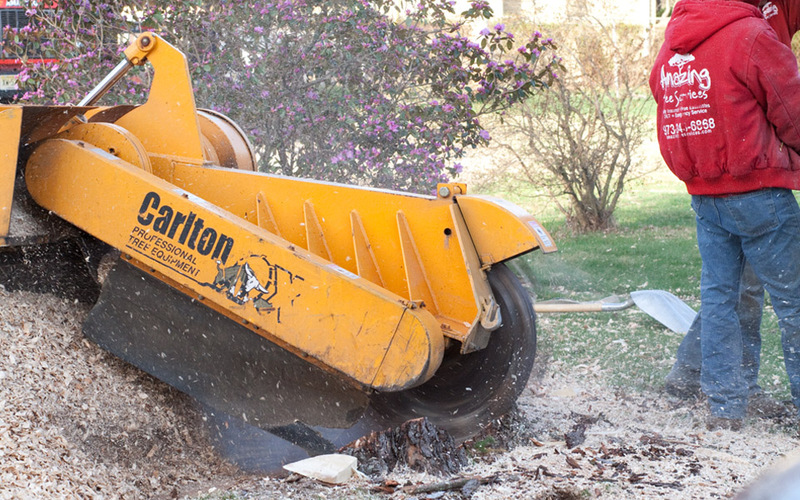 Excess debris may fall into the yard, as can branches and dead leaves. The tree may have roots that rise above the earth, posing both a physical threat as well as destroying the appeal of your home. Our tree services in NJ providers are quite familiar with the tree removal process. Right between planting new trees and removing the old trees would be trimming a tree or cutting down branches. Again, there are different reasons a homeowner may go ahead with this service. For one, leaves and branches are falling into their yard. Also, they can cut down the tree to provide light to one area and shade to another. Lastly, the tree can be designed into a more pleasing shape, as residential trees are also part of the home’s design. Trees are a gift from nature. Getting the most out of them means different things to different people. With our tree services in NJ, you can have the yard of your dreams. For more information about tree services in NJ, call the professionals at Amazing Tree Services today at (973) 343-6868. When a tree shows symptoms that it may die soon, you need a treeremoval company in NJ with the experience and efficiency to safely remove it from your premises. Our team has serviced NJ with tree removal for years, and our dedicated and knowledgeable team focuses on keeping your property, family, or employees safe from a hazardous tree. With the right equipment and methods, we are a tree removal company in NJ that can expertly rid your property of a problematic tree before danger strikes. During the fall, we are given a glimpse into a tree’s inner branches. Sometimes, trees that may appear healthy are actually showing signs of decline at their crown or within individual branches. Dead branches appearing next to live ones and premature leaf loss are signs that your tree is in need of aid. Within a year or two, these trees could die and pose a danger to structures on your property. Our tree removal company in NJ provides free tree estimates so you understand what to expect from your tree in the future. 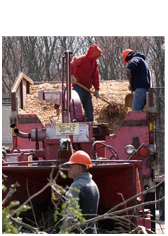 When we perform tree removal in NJ, we utilize care and sensitivity to the nature of our operation. We understand how our tree removal company in NJ can become the focus of your employee’s day and take away from productivity, which is why we look to remove trees from your property promptly and a time to match your convenience. Before you know it, hazardous trees on your property will be removed and hauled away, leaving you with peace of mind and safety. With our professional experience and commitment to your satisfaction, our tree removal company in NJ can beautify your property, allow for more acreage, or remove danger in a timely manner. A tree showing symptoms of dying needs to be remedied or removed before it creates a liability for your home or office. For more information about our leading tree removal company in NJ, call the experts at Amazing Tree Services today at (973) 343-6868. This fall, prepare your trees for the upcoming winter with our commercial tree services in NJ. This year, we’ve experienced a drought that’s caused early foliage for much of the state. Instead of striking reds and yellows we’ve seen many leaves simply turn brown, curl up, and fall. While early foliage makes for poor hikes and views, it also potentially creates dieback in trees which can cause potential danger for any structures in the vicinity of the tree. Our professional team offers free estimates for our commercial tree services in NJ and promptly provides expert service with the right knowledge, tools, and years of experience to keep your property safe and looking beautiful. When drought occurs, as it has in NJ over the past weeks, trees don’t receive the right amount of water they need to survive. Dieback means that a tree is in danger of dying within the next year or two. Dieback can be difficult to spot because it typically occurs from the crown of the tree downward. You may notice some healthy looking branches next to barren, dead branches. Premature leaf coloration and early leaf-dropping are general symptoms of dieback, which can mean that the tree will die within a year or two. A dying or dead tree on your commercial property not only jeopardizes your office, but becomes a liability if any of the branches begin to fall. Our commercial tree services in NJ can prevent damage by assessing the trees on your property and offering a remedy, whether it be tree trimming, tree pruning, or tree removal. For trees that have not experienced early color change, you can prevent dieback by watering the trees weekly until winter. Two to five gallons of water per week should keep them hydrated when there has been little rainfall, and keep them healthy throughout the winter. Our commercial tree services in NJ can prune any dead tree branches in late fall that might cause a tree disease or house insects that can cause havoc on the remaining healthy branches. If you are applying mulch before winter to control moisture and temperature to the roots, you should always purchase one that promotes root growth. Commercial tree services in NJ maintained regularly throughout the year will create a stronger tree, much more capable of withstanding foraging animals, snow accumulations, drought, and branch breakage in winter. We also serve communities in Passaic County, Morris County, Essex County, and Bergen County. For expert commercial tree services in NJ performed efficiently and at competitive prices, call Amazing Tree Services today at (973) 343-6868. In need of lot clearing in Morris County NJ? Maybe you just purchased a plot of land and are looking to develop for personal or commercial use. In either instance, you will need to remove any rocks, debris, and intruding trees to prepare for your plans. Our professional team can perform lot clearing in Morris County NJ efficiently, managing the removal of all unwanted natural elements from the property quickly and affordably to keep you on track with construction. In NJ, the northwest offers some of the most forest and foliage within the state. So when you choose a land parcel in the the general area, you will first need lot clearing in Morris County NJ before getting underway. This crucial first step readies your land for your intended use, making sure to remove any unsafe brush before it becomes a safety hazard or liability. Our team utilizes up-to-date equipment, tools, and owns our own fleet of trucks - including a crane. We will work with you to develop a strategy for lot clearing in Morris County NJ that maintains the beauty of your land's forest while removing anything that might pose a threat. ...and many other services. When we get to work, we ensure that your land is ready to use quickly - leaving no unwanted rock, tree, or brush left behind. Once lot clearing in Morris County NJ is performed, your land will be ready to create in your image for a beautiful home or office space. Whatever your intended use, we have the knowledge, tools, professionalism, and dedication to make sure the job is done to your specifications. When you need lot clearing in Morris County NJ, or for more information about our tree services in NJ, call us today at (973) 343-6868.